2Q17 gross revenue in line with our forecast. Raised FY17e/FY18e DPU forecast by 6.0%/7.6%, on revised property expense and finance expense assumptions. Leasing remains soft with -9.8% reversion. 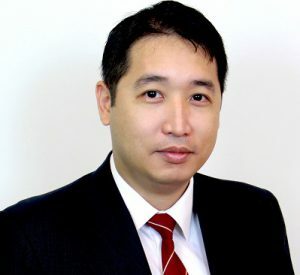 + YoY growth in gross revenue driven by inorganic growth: Bukit Batok Connection acquired in 3Q16 and contributed S$2.0 million to the YoY higher gross revenue. + QoQ improvement in portfolio occupancy from 91.8% to 92.6%: Eightrium back to full occupancy (from 97.9%) and 22.8% occupancy at 72 Loyang Way (from 9.9%). + Tellus Marine property (39 Senoko Way) unaffected by tenant default: The tenant had defaulted at ESR-REIT’s property (21B Senoko Way) and consolidated its operations at its existing SBREIT property. Gross rental contribution is actually higher because of the new annex block that was completed in November 2016. – Negative reversions for forward renewals accelerated QoQ*: From -6.0% to -9.8%. – 72 Loyang Way remains under-utilised: JTC had waived the oil & gas tenant requirement for 30% of the property, but 70% of the property will still have to comply with the anchor-tenant requirement from the oil & gas sector. 72 Loyang Way contributed 6.4% of gross revenue in 2Q17 and we estimate this to fall to ~2% going forward as the security deposit has been depleted. 72 Loyang Way will continue to impact the portfolio as it converts to a multi-tenanted property with the REIT bearing the property expenses. The key challenge is to find a qualifying anchor tenant to lease 70% of the property. 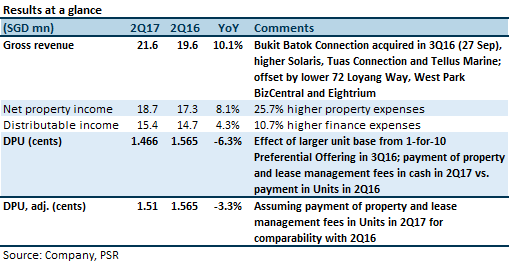 Maintained pressure on rental reversions expected in 2H 2017, then easing to low single digit negative reversions in 2018. We made some adjustments to our assumptions, raising our FY17e/FY18e DPU by 6.0%/7.6% from previous forecast. We expect a 7.6% yield and our target price gives an implied FY17e P/NAV multiple of 1.05x. * Forward renewals are renewals done in the current quarter for a lease expiring in a future quarter. Soilbuild Business Space REIT (SBREIT) is relatively undervalued to the peer average P/NAV multiple, and has a higher yield compared to the peer average.